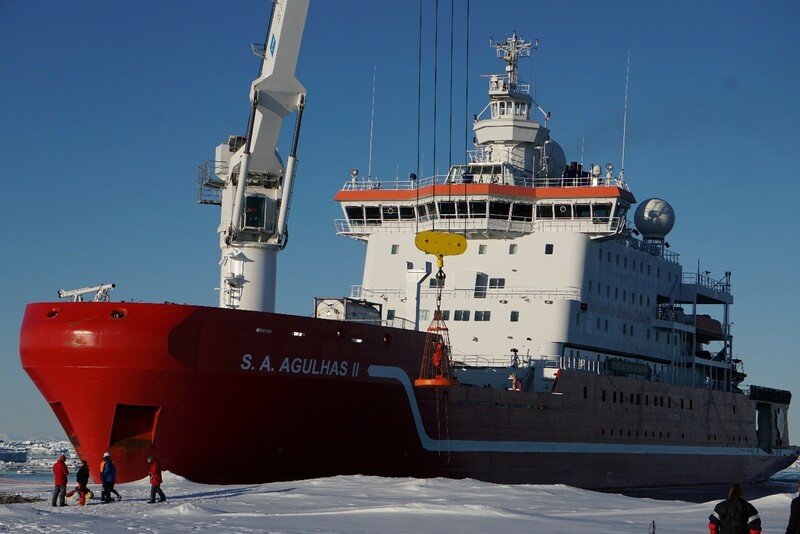 At the start of January 2019, Dr Jeff Evans, a Senior Lecturer in Physical Geography in the School of Social Sciences, boarded the 134m-long S. A. Agulhas II – one of the largest and most modern research ships anywhere in the world. The Loughborough University academic joined more than 30 international scientists from different scientific fields and renowned organisations on the Weddell Sea Expedition, which is to attempt to locate and survey the wreck of Shackleton’s ship ‘Endurance’ and increase understanding of Larsen-C, one of the largest ice shelves in Antarctica. The expedition’s science programme has been completed and many of the scientists – including Dr Evans – have now bid a fond farewell to the S.A.Agulhas II as it heads to the Endurance wreck site. Dr Evans has carried out extensive research into ice-mass and environmental change in the Arctic and Antarctic and participated and co-led the coring work on Larsen-C.
Below he discusses how the science programme went and what’s next for the ship. We have continued to undertake fieldwork immediately offshore of the Larsen-C Ice Shelf. Gravity core used to recover sediments from the sea-floor. 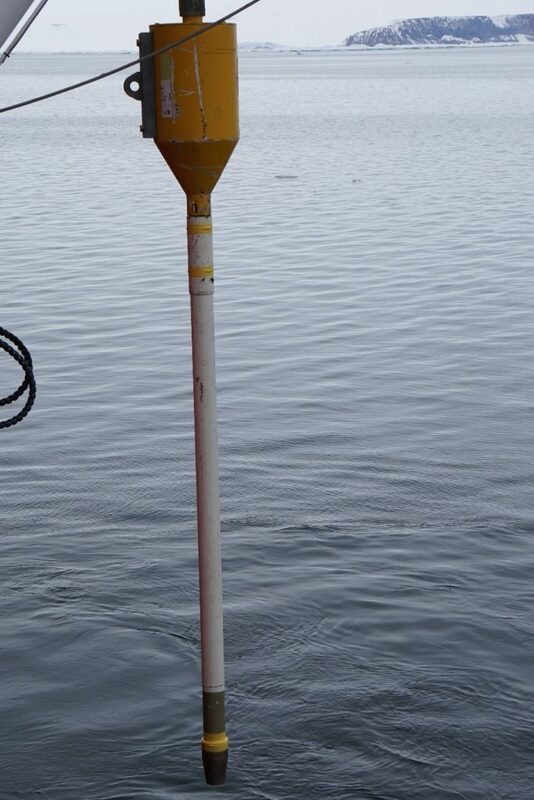 The yellow weight at the top weighs 1,500kg and drives the corer into the sea-floor. Iceberg A68 has continued to prevent the Weddell Sea pack ice from drifting into the work area for much of the time. Much of our time has been spent along the edge of the Larsen-C Ice Shelf where science operations involved repeated oceanographic measurements of the water column adjacent to the ice shelf to determine the volume and rate of fresh, cold ice-shelf water formation due to the melting of the ice shelf base and the intrusion of relatively warmer water masses from the Weddell Sea under the ice shelf. We also continued to core sea-floor sediments along the front of the Larsen-C Ice Shelf. Coring of sediments in the region has proved a challenge with many coring attempts failing. Imagery and video footage from the ROV (remotely operated underwater vehicle) biological surveys of the sea-floor reveal the widespread presence of large rock clasts and these prevent the core barrel from penetrating the sea-floor. Therefore, recovery of one sediment core requires two or three attempts at coring. A gravity core full of sediment on deck. The rock clasts are released or dumped into the ocean during iceberg melting or overturning where they then sink through the water and deposit on the sea-floor. The two autonomous underwater vehicles (AUV) and their downward and upward looking swath systems were used to image the underside of sea-ice floes and sea-floor areas inaccessible to the ship. AUV surveys of the underside of a range of ice-floes were undertaken in order to measure the roughness or irregularity and depth of the sea ice base. 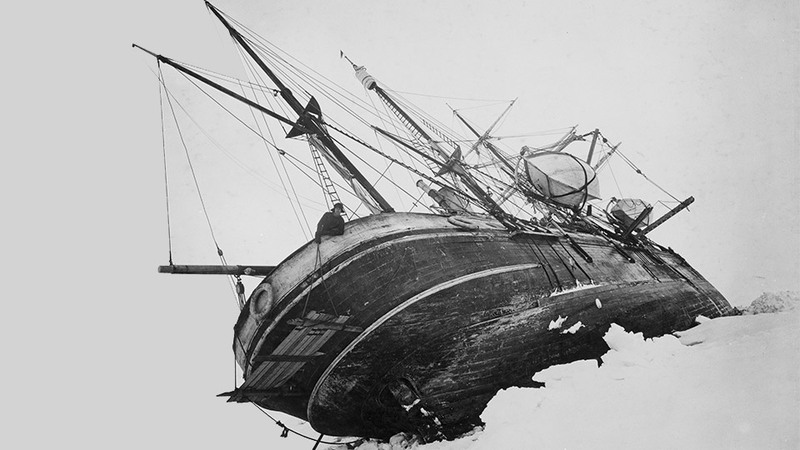 The ship wedged into the ice, unloading scientists onto the ice floe in order to undertake sea ice measurements. These measurements are combined with snow depth and density measured across the surface of the same sea-ice floes. 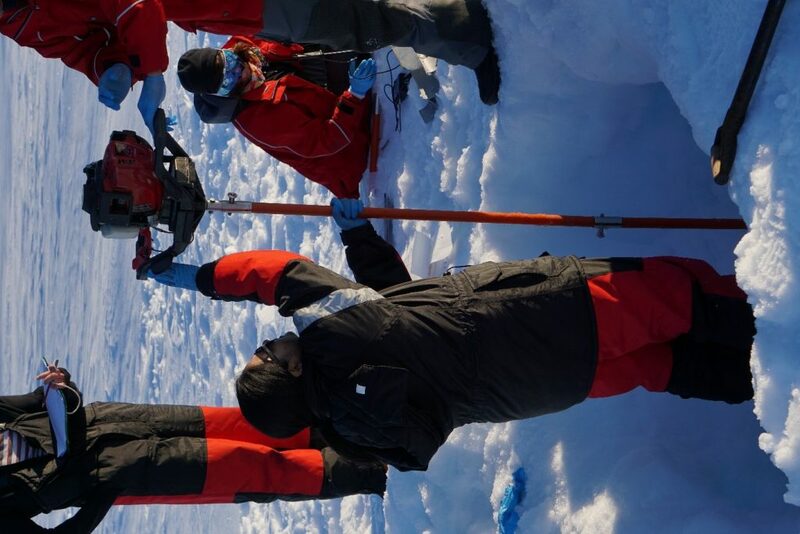 Measuring snow depth on a sea ice floe. 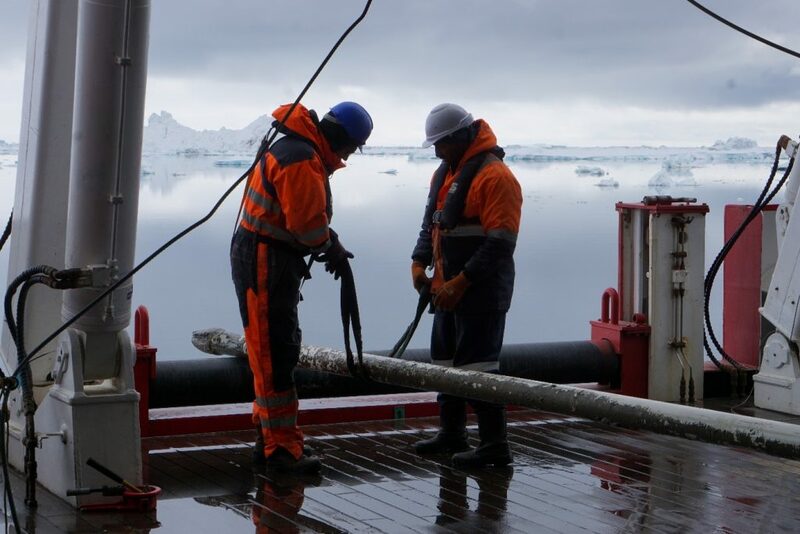 Drilling sea ice to obtain ice cores and determine ice thickness. These are vital parameters for determining sea ice thickness and volume and melting rates of the ice. Higher roughness or irregularity can lead to higher basal melt rates. AUV surveys of the underside of sea-ice floes are not without their challenges. It was during the survey of a multi-year sea-ice floe (ice thickness of 20 – 30m) that the AUV terminated its mission due to an error and it surfaced under the ice floe and became trapped in an ice cavity rather than surfacing in open water. Multi-year sea ice ridge caused by the compression of two ice floes. Ridging of this nature means a ship trying to break the ice will have huge difficulties. This meant that the ship had to carefully and incrementally break the ice floe in order to get closer to the trapped AUV. The total area of ice carved out of the sea-ice floe by the ship was 0.57 km2, equivalent to 0.01% of the total surface area of A68 and 114 full-size football pitches. You could probably fit 114,000 upright adult Adelie penguins in the hole! The ROV was then used to reach the AUV under the remaining ice and attach a tether or tow line to the AUV and slowly drag it back into open water where it could be retrieved by the ship. The whole process of locating the AUV under the ice, breaking the ice floe and retrieving it with the ROV took a few days but was essential. Taking a well-earned break on the sea ice. The AUV with the downward looking swath system was used to image the sea-floor and specifically grounding zone wedges. Glaciers draining the interior of Antarctica that reach the surrounding ocean float to form ice shelves that fringe the Antarctic coast or within embayments. 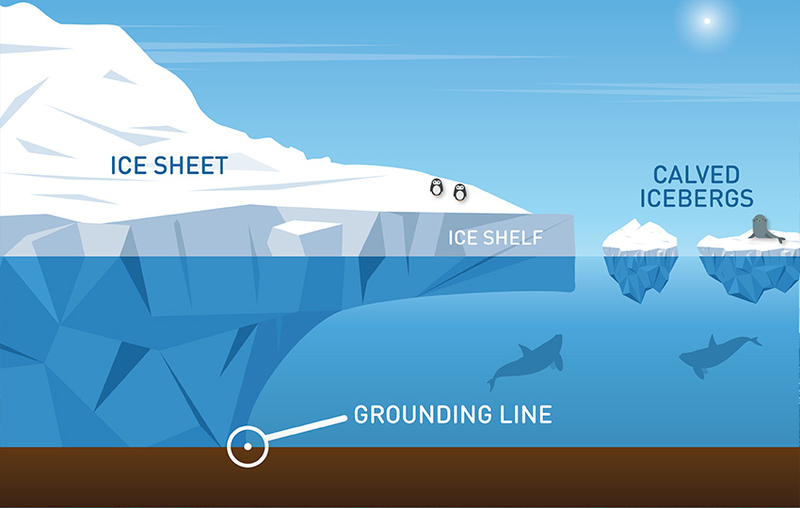 The point at which the glacier begins to float is the grounding line or zone, and the processes of ice-ocean interaction that takes place here determines the relatively stability of the glacier and ice shelf. Grounding line retreat is normally indicative of ice-mass loss from the glacier and ice shelf. The grounding line is also the location where the bulk of the sediments transported at the base of the glacier are released to the sea-floor and form a prominent asymmetric, smeared ridge of sediment termed a grounding zone wedge. 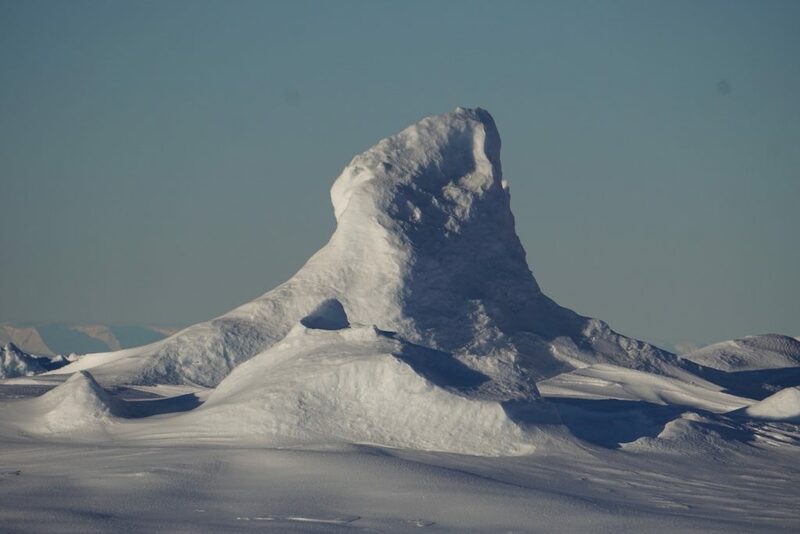 The grounding line of contemporary glaciers and their ice shelves are inaccessible to ship-based surveys or direct sediment sampling, and the considerable distance between the ice shelf edge and the grounding line prevents the use of AUVs, so our understanding of this environment is limited. 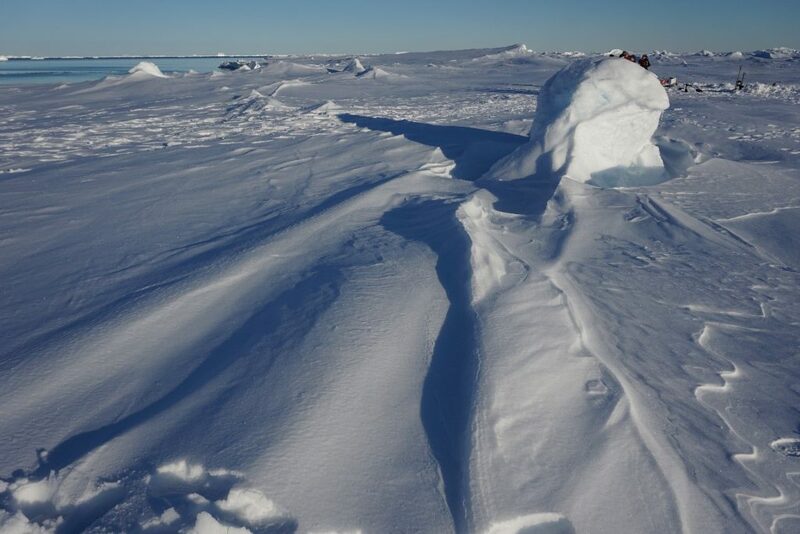 The expedition has found a series of grounding zone wedges beyond the present-day ice shelf edge that must have been formed some time ago associated with past ice shelf change and glacier retreat. The AUV was used to survey and produce 3-dimensional bathymetric profiles and imagery of the grounding zone wedges in unprecedented cm-spatial scales. Further analysis of the acquired data will enable us to understand the ice shelf grounding zone environment in far more detail than is the case at present. 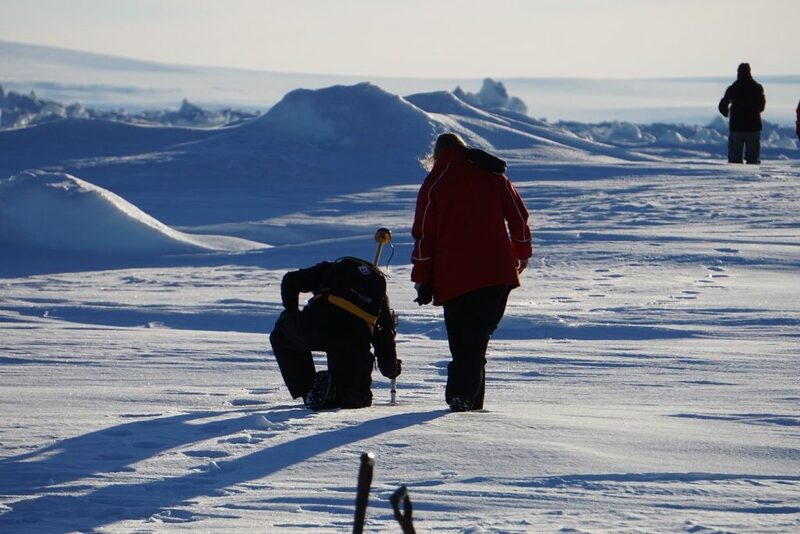 Sediments cored from the grounding zone wedges will also be analysed to determine when they were formed and when the ice shelf underwent change in the past. The favourable sea-ice conditions adjacent to the Larsen-C Ice Shelf changed towards the end of the planned science time. Prolonged easterly to south-easterly winds caused the dense pack ice to spill around the northern end of A68 and to start filling the open water between the iceberg and the ice shelf edge. 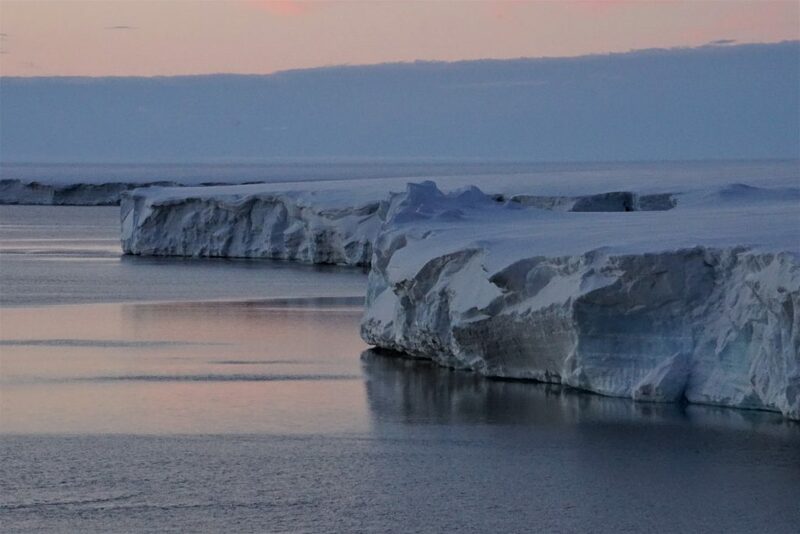 Therefore, the science programme at the Larsen-C Ice Shelf was curtailed a day earlier than originally planned, and instead, our science efforts were switched to the more partially sea-ice covered waters of the Larsen-B and Larsen-A areas to the north. This is my final blog of the trip as the science programme was completed at the end of January. The ship is currently headed to the Endurance wreck site where technicians from Ocean Infinity, Deep Ocean Search and Eclipse will undertake the search. The ship has skirted the northern and eastern edge of the Weddell Sea pack ice and has just entered it south of 70°S where the distance to the main wreck search area is shortest, leads are opening in the sea ice and the ship can drift north with the prevailing current and pack ice. The ship will have to negotiate single-year sea ice with open water leads between individual floes but the final 30 – 40 nautical miles of the journey to the wreck search area will be through 10/10ths of multi-year sea ice, and it is expected to take time to reach the start of the search. The search for the wreck will be extremely challenging in terms of negotiating the ice and deploying and recovering the AUV in 9/10ths to 10/10ths sea ice. The Endurance keeling over. 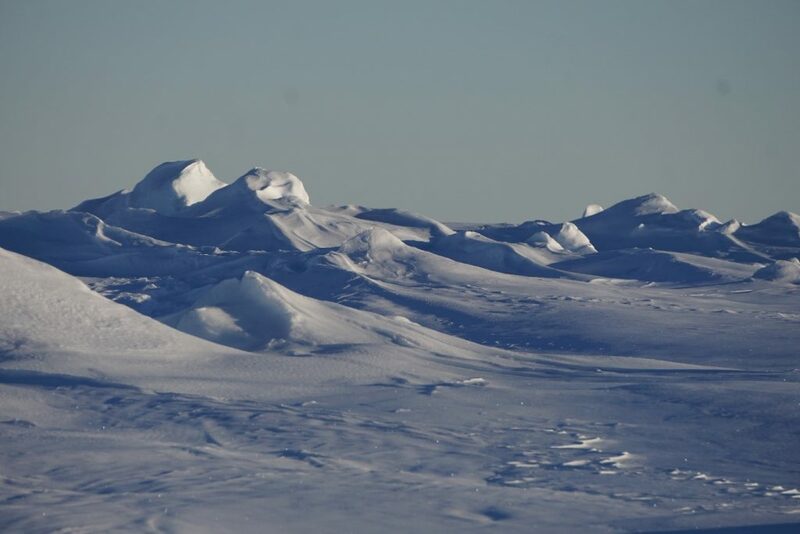 Image courtesy of Weddell Sea Expedition. The sea-floor in the Endurance wreck search area is mainly flat so any ship wreck or associated debris should stand out, and the cold oxygen-poor waters will prevent decay or rotting of the ship’s wooden hull. The AUV with its downward looking swath system will produce very detailed side-scan sonar and bathymetric images of the sea-floor at 10’s of cm to cm spatial scales, enabling the identification of the shipwreck. The AUV will systematically map the wreck search area and its swath system can survey up to 150m or more of sea-floor either side of the AUV heading line. Therefore, it can survey a large area of sea-floor in relatively short periods of time. 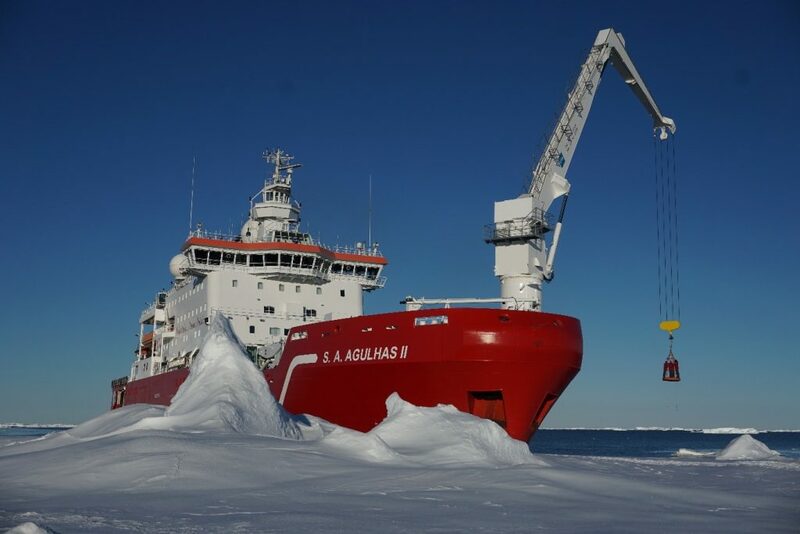 Approximately three days are allocated to the search for the Endurance as the SA Aghulas II ship has to return to Penguin Bukta in East Antarctica in less than 12 days to begin the end-of-summer demobilisation of the South African SANAE Research Station. Let’s keep our fingers crossed! 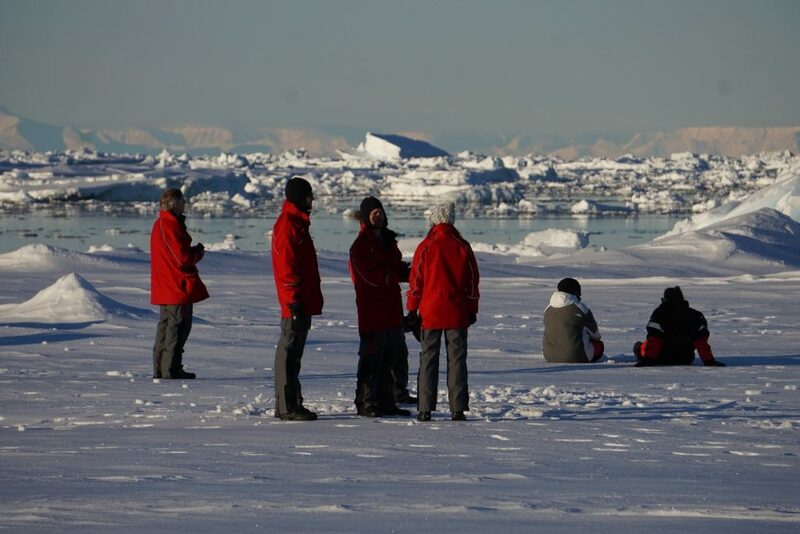 Read the first Weddell Sea Expedition blog post here. More information on the expedition and Dr Evan’s involvement can found in a press release here. ﻿Dear Mr Carney – have you forgotten the Phillips curve?